On Wednesday The New York Times published an 11-page strategy memo, "Our Path Forward," that outlines steps the news organization will take to double its digital subscription revenue and become mobile-first. Read our analysis here and read the whole memo below. From our earliest days, The New York Times has committed itself to the idea that investing in the best journalism would ensure the loyalty of a large and discerning audience, which in turn would drive the revenue needed to support our ambitions. This virtuous circle reinforced itself for over 150 years. And at a time of unprecedented disruption in our industry, this strategy has proved to be one of the few successful models for quality journalism in the smartphone era, as well. This week we have been celebrating a remarkable achievement: The New York Times has surpassed one million digital subscribers. Our newspaper took more than a century to reach that milestone. Our website and apps raced past that number in less than five years. This accomplishment offers a powerful validation of the importance of The Times and the value of the work we produce. Not only do we enjoy unprecedented readership — a boast many publishers can make — there are more people paying for our content than at any other point in our history. The New York Times has 64 percent more subscribers than we did at the peak of print, and they can be found in nearly every country in the world. Our model — offering content and products worth paying for, despite all the free alternatives — serves us in many ways beyond just dollars. It aligns our business goals with our journalistic mission. It increases the impact of our journalism and the effectiveness of our advertising. It compels us to always put our readers at the center of everything we do. In turn, our readers are helping our journalism achieve unprecedented reach and influence, making The Times the most‐discussed news publisher on social media, the most‐cited by other media outlets, and the publisher with the most other sites linking to its work across the entire Internet. And those readers are helping The Times build the most commercially successful digital news business in the world. This unique and enviable place we occupy in the media landscape is the result of years of hard work in every part of the company. The Times has worked diligently to secure its financial health and to reorient itself to address new challenges. We have more than doubled our digital revenue in the last five years and have amassed a considerable cash reserve. We have moved quickly to transform digital advertising, build our digital audience and subscriber base, and create the most ambitious multimedia report in the world. A strong and united team is collaborating better than ever across news, business and technology and showing why the dominant voice of the print era will be the dominant voice in the mobile era as well. With a number of important efforts underway that are aimed at accelerating this progress, we want to use this moment to share our challenges, our progress and our plans for moving forward. Skeptics still openly wonder if we can continue to deliver on this journalistic mission, given the seeming mismatch between the economics of news media and the scale of our operations. They suggest the days when a media company can fund a big, ambitious newsroom are over. They doubt we can continue to cut legacy costs and fund digital innovation at the same time. These are serious and fair questions. The most pressing challenge is not to prove that our journalism matters — it's to demonstrate that our business can continue to support this mission. Our response is that we are more confident than ever in the path The Times has chosen, and that confidence is grounded in our track record. In less than five years, The Times has succeeded in doubling its digital‐only revenues to roughly $400 million last year. To put that figure in context, that was about as much as four of our highest‐profile digital competitors — Huffington Post, BuzzFeed, Vox Media and Gawker Media — reportedly earned last year combined. We've done this by prioritizing digital growth, while also carefully managing our print operations and reducing costs throughout the company without sacrificing excellence. And we've done this by building the largest audience of readers — we are visited on over 140 million devices around the world each month — and paying subscribers in our history. This combination of mass reach and a large subscription base is unique in our industry. The million‐digital‐subscribers mark is the clearest sign yet that the biggest bet we placed as a company is paying off. The money contributed directly by readers now makes up more than half of our total revenue. Far from plateauing, our digital subscriber growth has been accelerating, particularly in international markets. As more digital readers gravitate toward quality, both in content and experience, we believe that offering the world's most journalistically and digitally sophisticated news products will continue to provide us with a unique advantage. This consumer revenue stream places The Times on a more stable foundation at a time when many media organizations are struggling against the constraints of an increasingly difficult digital advertising market. Indeed, the subscription model has strengthened our digital advertising business partly because our direct relationships with readers and our commitment to quality make The Times so valuable to advertisers. Despite these very real successes, we need to move with much more urgency. For all that we've accomplished, our digital business is not yet close to supporting the scale of our ambitions. This is why we are setting the goal of doubling our digital revenues over the next five years, to reach more than $800 million in digital‐only revenue by 2020. To get there, we must more than double the number of engaged digital readers who are the foundation of both our consumer and advertising revenue models. These are ambitious targets. Though both digital revenue and digital subscribers have been growing by double‐digit rates, we need to not just maintain but to increase this growth in coming years. We must succeed if we are to return The Times to a position of growth and outpace the slow but inevitable decline in print. Reaching these targets would take us past the point at which digital revenue exceeds print revenue, an important milestone for the long‐term sustainability of our mission. At the same time, our challenge extends beyond just revenue or audience. These targets are set against a backdrop of continued change across our industry. These shifts are going to continue to pick up speed, and The Times has to respond by moving faster, too. This means we must continue to operate more efficiently and ensure that we have the right skills, structures and processes to push us forward. Our organization was built for the print era and now must be redesigned for the mobile era. Much of the last year has been focused on making exactly these kind of improvements, and the efforts to change how we work across the company will continue over the coming years. This was the central theme of the Innovation Report, and a year later we can say that we have successfully checked off all of its major recommendations. Indeed, our remarkable success with audience development is a reminder of how quickly we can move when we put the right people with the right skills into place and empower them to push us forward. But this transformation is nowhere near complete. Our overarching aspiration is to cultivate another generation of readers who can't imagine a day without The New York Times. Our first two million subscribers — including our more than one million newspaper subscribers — grew up with The New York Times spread out over their kitchen tables. The next million must be fought for and won over with The Times on their phones. To do that, we are accelerating our efforts to be the best destination for curious, discerning readers interested in news and lifestyle content in the mobile era. Serving as an essential part of our readers' lives requires us to tell stories, build products and tailor the experience in even more relevant, engaging and useful ways. Creating and distributing the best news, features and opinion is absolutely essential, but it is not enough. We must also help guide readers through a world awash in information and choices and make it easier for them to make decisions that enable them to live active and ambitious lives. Though "user‐first" has become a popular buzz‐phrase in recent years, it has real meaning for us. While most of our competitors chase scale, our unique business model is built on directly asking our most loyal readers to help us pay for our massive newsgathering operation. In addition to contributing all of our digital subscription revenue, they also are responsible for driving the majority of our advertising revenue through their deep engagement. The sustainable path to long‐term revenue growth requires that we always prioritize user experience and the needs of our customers over hitting quarterly revenue targets. These deep reader relationships are our most valuable asset. For this model to scale, we must be far more aggressive about finding and serving readers. That effort will not be linear and will not end at a clear goal line. Instead, it requires negotiating complicated balancing acts and continually refining our strategy. We must continue to deepen the engagement of our current readers while building new relationships with readers around the world. We must continue to find and engage readers on social media and other gathering places while also better demonstrating the unique value of consuming The Times on our own platforms. We must continue to guide readers with our editorial judgment, while also becoming better at using technology to anticipate and serve their personal needs and curiosity. We must carefully guard the excellence of our journalism while showing a willingness to change much of what we do and how we do it. Succeeding in balancing these tradeoffs and meeting our goals requires the contributions of every employee and a companywide commitment to evolution, experimentation and learning. And it requires a unified focus on meeting the changing needs of our readers. Here's how we are putting these principles into action across The Times. We will continue to lead the industry in creating the best original journalism and storytelling. ● More than anything, the best journalism will continue to separate The Times from the competition. This is why we have fiercely protected the number of reporters in our newsroom — we employ the same number today as we did in 2000, when newspapers were most profitable — and empowered them with time, resources and expertise to find and share the most important stories in the world. At the same time, our newsroom and opinion operations need to continue to evolve, which is why we have also prioritized adding journalists with new skills in graphics, video, technology, design, data, audience engagement and much more. ● Our team of journalists with deep technical and design skills, unrivaled in both size and achievement, is continuously reimagining how we tell stories and leading innovation across the media industry. The result is seen not just in the weekly parade of big multimedia projects but in the everyday brilliance of the visual and digital storytelling made possible by the Graphics, Interactive News, Digital Design, CMS and technology teams — from our daily briefings to our liveblogging platform to the analytical sophistication of The Upshot. Now we are pushing all our journalists to become more flexible in using these storytelling tools and techniques, ensuring we are serving our readers' changing habits and aren't bound by artificial limitations in forms tied to print. ● We are continuing to build new journalistic muscles as well. Video and live events are increasingly essential ways of connecting with new audiences. We will not be starting from scratch — our video department has been nominated for and won more Emmys than any publisher over the last few years, and our events and conferences are making news and developing worldwide audiences — but we must expand our investment and refine our approach in these areas and we will be sharing more about our plans for elevating both operations in coming months. We will transform the product experience to make The Times an even more essential part of our readers' daily lives. ● Our readers increasingly expect their experience on our website and apps to be responsive to their individual interests and needs. We are shifting from a pure broadcast model to develop one‐to‐one relationships with readers that tailor the way they experience our content, while still retaining our unique editorial judgment in setting the day's agenda. We are trying new features and making improvements monthly — from mobile alerts connected to readers' interests to articles that rewrite and contextualize data based on your hometown — and we are assembling teams to take on the more ambitious work of designing fully personalized, responsive experiences, starting with mobile. ● Mobile is not simply another distribution method; it is transforming the way people consume news and information. The way we tell our stories, the design of the experience and the speed and functionality of the products will be critical to differentiating The Times from the competition. We have been improving our two main entry points on mobile — our home page and our article page — making these experiences more visual and helpful, with features like bigger photos and bullet points to distill breaking news. And we are investing new focus into pushing information to readers, whether that is through newsletters, push alerts or new formats like the Apple Watch. ● Our readers turn to The Times for more than just news and entertainment. They turn to us to help them make decisions in their daily lives. The newspaper has always provided a significant service role — helping readers decide what show to see, what book to read and what apartment to buy — and we believe we can add even more value on mobile. The effort to modernize our service journalism began with Cooking a year ago. Our goal was to use our content and expertise to address a specific need for our readers: what to cook for dinner. With almost five million monthly users, Cooking has been so popular with readers that we are expanding this service approach to other areas starting with real estate, health, and film and television. Together these efforts aim to reimagine our features sections for the mobile era with the same vigor and creativity that we put into launching them in the 1970s. We will continue to develop new audiences and grow The Times as an international institution, just as we once successfully turned a metro paper into a national one. ● The Times brand already resonates globally and our progress expanding our overseas audience has accelerated, with an increasing percentage of our subscribers coming from abroad. Today we boast paying subscribers in 193 countries and our London, Paris and Hong Kong offices have become key parts of a truly global operation. But our efforts are still disjointed and underfunded relative to their importance. We have appointed Joe Kahn and Stephen Dunbar‐Johnson to ensure we are aggressively executing a unified approach to international content, audience development and monetization efforts across the company. ● As part of these efforts, we will continue to test and refine new country‐specific approaches to reaching new audiences and gaining subscribers, including experimenting with translations, local briefings and specialized content built for social media. The focus of this approach— which began in Mexico and is already underway elsewhere — is to tailor our journalism and products to make them more relevant for specific new audiences, rather than viewing the rest of the world as just one big audience. ● The next generation of readers, both at home and particularly abroad, will be found on other platforms, where we must continue to be a leading voice. We are poised to become the first publisher to boast 20 million Twitter followers and 10 million Facebook fans, a sign of the strength of both our journalism and brand. We will continue experimenting to reach new readers offsite and in new formats, from Facebook Instant Articles to Apple News to Snapchat. But our clear focus remains on driving interested readers back to our platforms where we can expose them to the full breadth of our work and help them build a lifetime relationship with The New York Times. ● Our investment in audience development over the last year succeeded in expanding the overall number of readers who visit our own platforms by nearly a quarter, while also increasing the number of deeply engaged readers. Moving forward we will be particularly focused on younger readers, who are already our largest category of readers — 40 percent of our mobile audience is under 35 years old — but who lag other groups in engagement. Expanding these relationships isn't just a matter of growing our audience; it will help us stay ahead of the curve. Young readers were the first to shift to mobile and the first to embrace social platforms, and they have become reliable first indicators of major trends that ultimately affect our entire audience. We will improve the customer experience for our readers, making it easier to form and deepen a relationship with The Times. ● As our subscription model approaches its fifth anniversary, we know it must be updated with simplified pricing options that reflect our readers' multiplatform lives. We are actively testing to find the right price and approach. Even though it may come with short‐term costs, we believe making our subscription offerings more intuitive will increase subscriber growth and retention, and ultimately revenue, in the long term. ● Every moment in the reader's journey, from visiting for the first time to registering as a user to becoming a lifelong subscriber, must be frictionless, intuitive and responsive. To support this goal, we will improve each stage of the experience. This includes our efforts to add benefits for registered users, our move to free subscription trials that better showcase the breadth of The Times and our improvements to a customer experience that rewards loyalty and habituation. Once readers pull out their wallets, we must work tirelessly to increase the value of their subscription with better features and service. ● We must get better at demonstrating and communicating the unique value of reading — and especially paying for — The New York Times. This includes everything from how we market the Times brand to how we ask people to pay for a Times subscription to how we present our content on our own and others platforms. To this end, we're continuing to bolster our marketing team and will be adding leadership for brand marketing and creative services. We will continue to grow digital advertising by creating compelling, integrated ad experiences that match the quality and innovation of The Times. ● The advertising landscape is in a period of significant change with the rise of ad blocking software and growing concerns that many ad formats are either ineffective for advertisers or problematic for users. Though these outside forces may slow growth in advertising revenue in the short term, we believe that the long‐term effect will be to push the market back to trusted brands offering high quality. The Times continues to push for a better approach, ensuring that advertising is an integrated and value‐adding — or at least not detracting — part of our overall experience. ● Our direct relationships with readers, and deep understanding of their needs and behaviors, will continue to enable us to create high‐performing ad products that add value and fit comfortably into their overall experience. Our expanding investment in ad product innovation, including the recent launch of Mobile Moments, will allow us to continue to grow our digital advertising business, particularly on smartphones. Still, this is an area in which we must pick up our pace to match the market, particularly with video. ● T Brand Studio has become the industry leader in creating innovative advertising that is as engaging and well‐executed as some of our best stories. In less than two years, it has become one of the fastest growing parts of our business, producing work for more than 50 marketers across nearly 100 campaigns. We are expanding T Brand Studio into an agency in its own right, providing a broader array of marketer products and services around content ideation, creation and distribution. ● We will ensure that advertising is regarded as an essential part of the user experience, to be part of the development process from the outset for every new format and product. As we did with the integration of Google Maps into our 36 Hours travel franchise and as we are about to do with a remarkable virtual‐reality package, we'll find sponsorships that add value to user experiences without confusing readers or compromising the independence of our journalism. This is why we have announced that Trish Hall, one of our most accomplished and creative editors, will collaborate with advertising to identify potential sponsorships and other opportunities. Though the newsroom will always guard against potential conflicts, the best way to do so is to be active and open partners. We will continue providing the best newspaper experience for our print readers and advertisers, while carefully shifting time and energy to our digital platforms. ● The newspaper, while hardly immune to the forces affecting the rest of the industry, remains vibrant, popular and profitable. This year saw the release of our largest Sunday newspaper in decades and largest magazines ever. Remarkably, we've done this while cutting more than $500 million in print expenses over the last decade. We will continue our efforts to improve and streamline newspaper operations, which have been a model for the company as a whole, while enhancing the quality of the newspaper that our readers and advertisers find so valuable. ● We have created a print‐focused desk in the newsroom to assemble the newspaper at the end of each day. This ensures that even as we ask most of our journalists to focus on our digital report, a talented group of print‐focused editors are dedicating themselves to maintaining the excellence readers have come to expect from the paper. Though one motive is freeing up more energy for digital, this should also signal our commitment to our newspaper and our recognition of the skills and experience needed to produce what is rightly known as "the daily miracle." ● We will continue to treat print as a product that can evolve and improve. In the last year, we cut two sections (Autos and Home) that no longer had a compelling journalistic or business reason for being. At the same time, we added a new section (Men's Style) and invested heavily in our two magazines. Just as these efforts have also improved our digital report, we are actively enriching the newspaper with digital‐first features like The Upshot. ● Deepening our newspaper subscribers' relationship with our digital products remains a priority. More than 90 percent have linked their digital accounts, and those who are active average more than three hours each week on our website and apps, making them some of our most engaged digital users. The recognition that their loyalty is to The Times, whatever the platform, is driving us to create more unified digital and print subscriber experiences. We will organize the way we work around our readers, not legacy processes and structures. ● The recognition that our most devoted readers generate the vast majority of our revenue will have a clarifying effect in setting priorities and confronting tradeoffs. 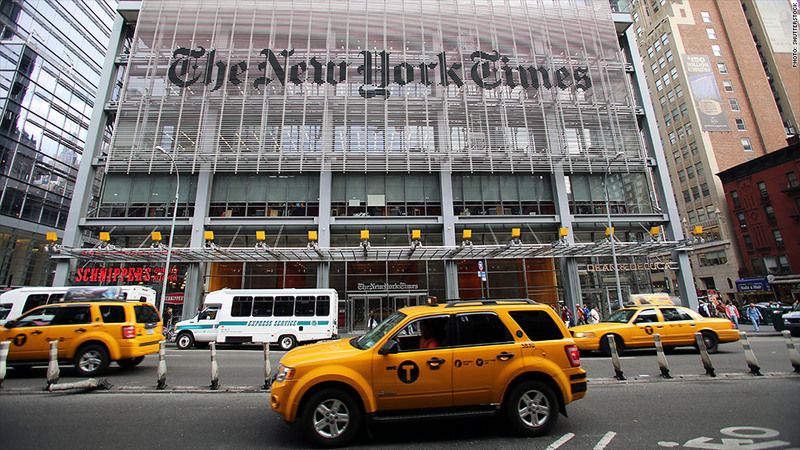 This unites the entire company around the shared goal of improving the experience for our loyal, habituated audience and making it easier and more compelling for new readers to make The Times an important part of their daily lives. Instead of blindly chasing page views, we must thoughtfully build an audience of loyalists. ● Data and analytics will enable us to better recognize and respond to our readers' changing habits and needs. Our talented team of data scientists, engineers, researchers and analysts have been moving aggressively to improve our data platforms, incorporate insights throughout our products and operations, and expand access to data and analytics for all Times employees. Over the last year, they have rolled out Google Analytics, developed a suite of home‐built tools and dashboards, expanded testing capabilities, and offered analytics training sessions. This month, for the first time, we will provide every reporter and editor with access to tools that will allow them to see how readers are finding and engaging with their stories. ● We are reimagining the way we build products to reflect the simple truth that journalism, audience development and revenue are not at odds but entirely dependent on one another. This includes continuing to expand on the success of the last year by empowering more cross‐functional teams — with news, product, design, technology, marketing and advertising working shoulder to shoulder — to create more cohesive and comprehensive products that meet our customers' needs across platforms. ● Over the next few years, the battle is going to be won or lost on smartphones. This continues to be our biggest area of focus in every part of the organization. But longer term, we have to build a flexible organization that can respond quickly to future changes in technology and user behavior. This new era will continue to be defined by relentless change: in technology, in consumer behavior, in business models. But what hasn't changed is what defines The Times. The first constant is our unmatched investment in journalism. That investment sent our journalists to more than 170 countries last year, from war zones to the lawless high seas to ground zero of the Ebola epidemic. That investment provides journalists the time and resources to uncover stories that would otherwise never see the light of day. That investment has allowed us to bring aboard more journalists who can code than any other news organization and empower them to invent new forms of digital storytelling. The second constant is our commitment to putting readers first. Punch Sulzberger often talked about how, in lean times, it was best to avoid the temptation to thin the broth and instead put "more tomatoes in the soup." When we were forced to ration newsprint during World War II, we filled our limited pages with news while other papers filled theirs with ads. During the economic downturn of the 1970s, we added new feature sections while others tightened their belts. And as the economics of the Internet put the entire media industry under unrelenting pressure in recent years, we sold off our non‐core businesses to focus our energy and dollars on The New York Times. We are in a moment of similar challenge. Over the next few years, we must find a way grow our digital readership and digital revenue to a point where we can continue to meet these enduring commitments to journalism and readers. Our strong shared sense of mission and values should give us the confidence to be even more ambitious and more aggressive in embracing change. As we execute and adjust our plans, we must remember that quality journalism and reader service don't just embody our mission; they represent our competitive advantage. At a time when other media organizations are seeing their brand power and customer relationships eroded by the proliferation of publishers and the expanding reach of platforms, our focus on readers and the quality of our journalism and our technology set us apart and create a powerful center of gravity. Our subscribers read hundreds of articles each month, on average, levels of engagement that are unheard at most media organizations. And every time major news breaks, the first thing millions more readers do is to head to The Times, looking for the most credible, authoritative account of what happened and the sharpest analysis of what it means. Our high‐level definitions of success also remain unchanged. We seek to advance our mission and remain faithful to our identity. We seek to continue to produce the world's finest news report, while making our digital business large and profitable. We seek to expand our loyal readership around the world and increase the impact and influence of our work. And we seek to foster the sense among employees that The Times is an exciting and meaningful place to work, focused on collaboratively solving big problems that will help lift up the entire media and technology industry. The work ahead of us is more important than simply securing the future of The Times. Our goal — indeed, our responsibility — is to prove there is a business model for the kind of ambitious, original, high‐quality journalism that is essential for an informed society. Though the scale and complexity of that ambition makes our road steeper and more difficult than it would otherwise be, it also makes it more essential that we succeed. The Times is forging this path from a position of strength. We have a track record of growth and excellence on which to build. We have a new leadership team that is united around these goals and we have committed employees who are the best in their fields. We have a mission worth fighting for. And we have an audience that is rooting, and paying, for The Times to thrive. Now we must do exactly that.